We would like to invite you to Echoes of Antropofest in Brno. It starts at Monday 11th May from 5pm in Cafe Falk, Gorkeho street. You can watch Common Roads, Ulice spojuje a Lakros - after this movie will be discusion with authors. Echoes of Antropofest in Pardubice are today. It starts at 7pm in Klub 29. You can watch Ulice spojuje (discussion with director will be follow after movie), Orchard Keepers and Honey. We apologize, but the screening of Bertsolari movie is cancelled. Workshops "Lakros - Ways of seeing" a "Common Roads - reaserch and production context"and projection of movie Bertsolari will be in Café Jedna in National Gallery, Dukelských hrdinnů 530/47, Praha 7. We are pleasured that we can welcome to Antropofest 2015 these guests: Livia Šavelková and Milan Durňak (Lacrosse), Lana Askari (Haraka Baraka), Tommi Mendel (Common Roads), Adélu Košařová (Odpad na talíři), Anna Dvořáková (Ulice spojuje), MIchal Pavlásek (Druhé Vojvodovo), Frode Storaas (The Go-Between), Christine M. Janney (Living Quechua) and Libor Dušek - author of the exhibition. 18:00 Výstava "Trojí tvář Váchánu"
Bertsolari is a documentary filmed in 2011 and deals with the phenomenon of impromptu versifying in the Basque Country. The movie is a collage of improvised poems, poets’ narrations, academic comments and recordings from poetic sessions. It aims to point out this unique form of poetic improvisation as well as to stress the importance of improvised word for contemporary society. Screenwriter and director Asier Altuna was born in Bergara (Basque Country) in 1969. He is famous for his films Aupa Etxebeste (2005) and Bertsolari (2011). 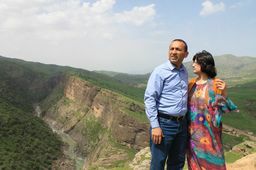 After having lived in the Netherlands for over 20 years, my parents, Gulzar and Shwan, decided to return to Kurdistan. Escaping the Iraqi regime as refugees in the early 90s, Kurdistan has recently developed into a regional safe-haven. However, with current tensions around ISIS, the social and political landscape is changing drastically. Haraka Baraka tells the story of my parents’ return to their homeland. 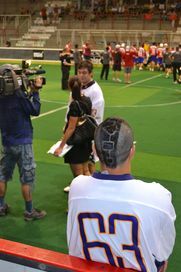 The film is about the lacrosse, and its importance for the Haudenosaunee people (represented by the Iroquois Nationals), and for the Czech people (represented by the lacrosse organisations, scouts, and woodcrafters). In 2011, the World Indoor Lacrosse Championship was held in Prague, the Czech Republic. It was the first time when the Iroquois National lacrosse men’s team visited the Czech Republic, using their Haudenosaunee passports. However, the film is not focused only on reporting of the Championship agenda. Furthermore, it highlights the essential spiritual, political and sport aspects of the lacrosse for the Haudenosaunne and Czech communities. It also explains the formation of this originally Native American game in the Central Europe, including the hint of political issues in the former communist Czechoslovakia. Lívia Šavelková – graduated from Charles University in Prague in ethnology and journalism at the Faculty of Arts and the Faculty of Social Sciences. She is fond of Lacrosse and since 2011 she and her colleagues have been revealing various forms and meanings of the lacrosse in different parts of the world. She works at the Faculty of Arts, University of Pardubice, Czech Republic. Tomáš Petráň – a filmmaker, teacher and also a farmer. He graduated from and also teaches at The Film and TV School of Academy of Performing Arts in Prague. He has produced a lot of documentary films, articles and also a book related to visual anthropology. He developed visual anthropology at the Department of Social Sciences at University of Pardubice between 2009 and 2013. Milan Durňak – “an ethnologist with a camera in his hands”. He graduated from Charles University in Prague in ethnology at the Faculty of Arts. His thesis was based on film trilogy TUMENGE/screened at Antropofest and Ethnofilm Čadca 2012/. He is a PhD candidate and continues in experimenting with visual anthropology.